Globally distinguished scientist Prof. Dr. Satyam Suwas, a guest at TU Dresden since April, is currently working on the phenomena of nanoplasticity. When the grain size of polycrystalline materials reduces, their strength grows. This effect, however, is turned around when it comes to grain sizes below about 20 nm. Most typically, the processes that result in grain refinement also significantly decrease the ductility, which is the material’s ability of being plastically deformed before breakage or tear. To attain maximum strength without losing a lot of ductility, the mechanisms of nanoplasticity have to be comprehended. This issue is what Prof. Suwas from the Indian Institute of Science is dealing with in the course of the Friedrich Wilhelm Bessel Research Award, bestowed by the Alexander von Humboldt Foundation. The award is to appreciate and promote Prof. Suwas’s exceptional accomplishments in the fields of severe plastic deformation and texture development of materials, where he contributed towards the important understanding of deformation mechanisms and the correlation of textures with properties. During his research stay of seven months at TU Dresden, Prof. Suwas is hosted by the Chair of Metal Physics, Prof. Dr. Werner Skrotzki at the Institute of Solid State and Materials Physics. Prof. Skrotzki and I have been researching in the same fields and exchanging ideas for almost 15 years. In 2003, we published our first paper together. Ever since my stay in France between 2002 and 2004, we have continuously been interacting, discussing and making substantial progress in this field. We know what to do and how to proceed. 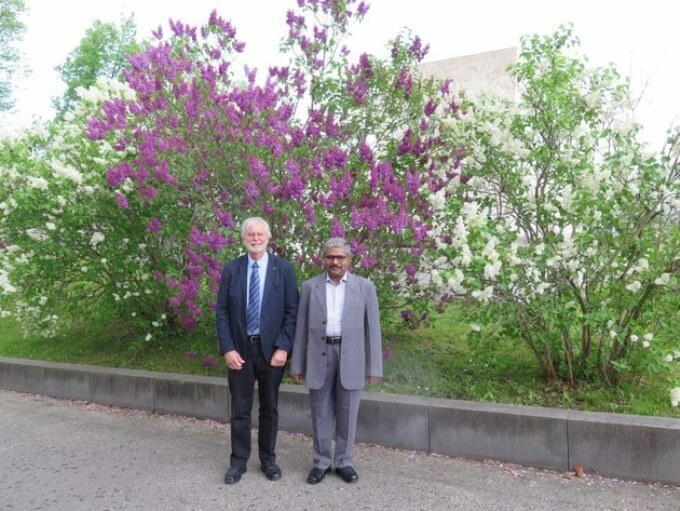 The professors are currently intensifying this established cooperation in Dresden until October - subsequently, they will continue to work on the research problem at their own institutes, Prof. Skrotzki at the Technische Universität, and Prof. Suwas at the Indian Institute of Science in Bangalore, where he is heading the Laboratory for Texture and Related Studies. This partnership not only brings the scientific locations of Dresden (Germany) and Bangalore (India) closer, but also merges the central understanding and applications. “If we are able to influence the properties of materials, like strength and ductility, in the right way, many applications can be foreseen. For example, it would enable easy forming of difficult to shape materials like titanium alloys”. The physicists are mainly studying the basic nature of nanocrystalline materials, while the engineering scientists are exploring their applications. “The fundamental understanding that we are exploring here has found a good combination with the application-oriented research of Prof. Suwas”, Prof. Skrotzki says happily.